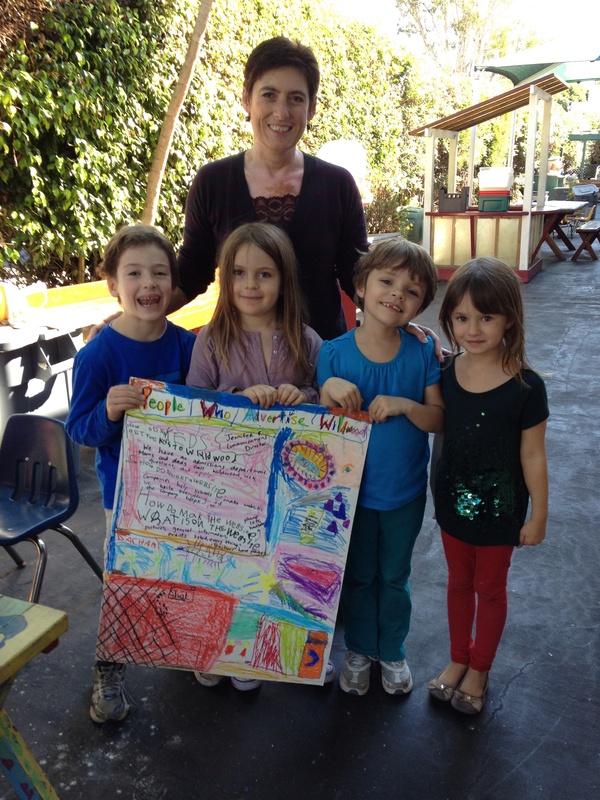 My interviewers and me with a poster they made that captures their study of my role at Wildwood. In my role as communication director for Wildwood School, I’m used to being the one asking the questions. I’m a former newspaper reporter, so I’m well-versed in the who-what-where-when-why-how line of inquiry. Therefore, it was with some reluctance today that I laid down my pen and pad and went from interviewer to interviewee. Sara Lev, head teacher for the Whale Pod (kindergarten and 1st grade), had invited me to her class as part of their “World of Work” unit. The class is learning about all of the different people work to make a school function. Kids were divided into small teams to identify and then interview the various Wildwood professionals. Preceding me were our security guards and facilities team; Counselor Chris Kiefer is scheduled for a visit in the coming days. My team of interviewers included Stella M., Zachary S., Nita K., and Esme W. They were armed and ready with a list of questions. Stella wanted to know how we get kids to come to Wildwood. This question was pretty easy, since the children and their parents had just gone through the admission process in the spring. My interviewers remembered their moms and dads coming for school tours and they recalled their own first visit. Stella even remembered her mom getting the acceptance letter in the mail: “I was nervous, but when my mom said ‘yes,’ I was happy,” she said. On to the next question. “How do you get a website?” fired off Nita. Um. How do I describe the years of work it takes to create a request for proposal, meet with multiple vendors, debate those vendors’ pros and cons, sign a contract, spend 18 months strategizing, writing, designing, and inputting data — to a passel of 5-year-olds? My admiration for my teaching colleagues grew another notch. Boiling down complex ideas into bite-sized nuggets, while still challenging and respecting kids’ intelligence, is as much an art as it is a skill. I did my best to answer Nita. She seemed satisfied. Zachary and Esme wanted to know how to make a website and what kind of information was on it. That was a little easier. I explained how we write about things going on at school and all of the information we share about Wildwood. They seemed satisfied with that answer. Still, I was surprised that these youngsters had such a clear understanding of the web; in fact, Stella said she had seen her teacher’s class page on our site. Sara wrote down my answers on a poster the kids had created, and they told me I’d get to keep the poster when they are all done with their work. That made my day. The interview concluded, and I headed back to my car. It struck me that just last night, I had presented an update on my work to Wildwood’s Board of Trustees. They asked questions, just like the Podsters. Honestly, I think the Pod kids were a tougher crowd.